INSPECTION: Morning of sale from 8:00am to 11:00 am. MicroVu mdl. H14 14” Floor Model Optical Comparator s/n 825 w/ MicroVu MD-1 Programmable DRO, Surface and Profile Illumination, 5” x 18” Table. SpeedFam Accu-Flat Dial Flatness Gage. Mitutoyo 12” Dial Height Gage. Mitutoyo 6”-12” and 0-6” OD Mic Sets. Mitutoyo and SPI Dial Bore Gages Mitutoyo and SPI OD Mics to 7”. 12”, 8” and 6” Digital and Dial Calipers Starrett Crystal Pink 12” x 18” x 4” 2-Ledge Grade “A” Granite Surface Plate. Yale mdl. GC030UAS083 GP 3000 Lb Cap LPG Forklift s/n L313076 w/ 2-Stage Mast, 130” Lift Height, Side Shift, Cushion Tires. Carolina 5000 Lb Cap Hydraulic Engine Hoist. Karstens Type K11 14” x 24” Cylindrical Grinder s/n 83 054 10 11 1 w/ Auto Feeds, Motorized Work Head, Tailstock, 8” 3-Jaw Chuck, 12” Diamond Grinding Wheel, Coolant. Karstens Type K11 14” x 24” Cylindrical Grinder s/n 84 009 06 11 1 w/ Auto Feeds, Motorized Work Head, Tailstock, 8” 3-Jaw Chuck, 12” Diamond Grinding Wheel, Coolant. Cincinnati mdl. R-75 10” x 24” Cylindrical Grinder s/n M274445 w/ Auto Feeds, Motorized Work Head, 8” 3-Jaw Chuck, 12” Diamond Grinding Wheel, Coolant. Cincinnati 10” x 24” Cylindrical Grinder s/n 4U2B5T-3 w/ Motorized Work Head, 6” 3-Jaw Chuck, Compound Grinding Head, 12” Diamond Grinding Wheel, Coolant. Heald mdl 273A ID Grinder s/n G3007 w/ Red Head ID Grinding Head, Motorized Work Head, 8” 3-Jaw Chuck, Coolant. Heald mdl 273A ID Grinder s/n NA w/ Red Head ID Grinding Head, Motorized Work Head, 8” 3-Jaw Chuck, Coolant. Karstens 10” x 12” ID Grinder s/n 1743 w/ Auto Feeds, Compound Grinding Head, Compound Wheel Head, Coolant. Overbeck Type 400I ID Grinder s/n 36599 w/ Auto Feeds, Red Head ID Grinding Head, Compound Work Head, 8” 3-Jaw Chuck, Coolant. Blanchard mdl. 11D20 20” Blanchard Grinder s/n B42-10-599 w/ 20” Magnetic Chuck, 10” Diamond Grinding Wheel, Coolant. Blanchard 20” Blanchard Grinder s/n 13477 w/ 20” Magnetic Chuck, 10” Diamond Grinding Wheel, Coolant. SpeedFam mdl. G32 “Free-Abrasive” Lapping Machine s/n G32BTGW2237 w/ 32” Dia Lapping Plate, (4) 12” Pneumatic Holding Plates, Abrasive System. SpeedFam mdl. G32 “Free-Abrasive” Lapping Machine s/n G32BTGW1822 w/ 32” Dia Lapping Plate, (4) 12” Pneumatic Holding Plates, Abrasive System. SpeedFam mdl. G32 “Free-Abrasive” Lapping Machine s/n NA w/ 32” Dia Lapping Plate, (4) 12” Pneumatic Holding Plates, Abrasive System. 1996 Kent mdl. KSG-616S 6” x 18” Surface Grinder s/n 96041010 w/ Sony DRO, 6” x 18” Fine-Line Magnetic Chuck. Brown & Sharpe 6” x 18” Automatic Surface Grinder s/n 523-618-5506 w/ 6” x 18” Magnetic Chuck. LeBlond Regal 15” x 42” Lathe s/n 2B1923 w/ 45-1800 RPM, Inch Threading, Tailstock, 8” 3-Jaw Chuck. Rutland Second OP Lathe w/ 230-3500 RPM, Tailstock, Cross Slide, 5C Collet Closer, 6” 3-Jaw Chuck. Ramco mdl. RML-25B Lathe s/n 722652 w/ 460-1850 RPM, 5C Collet Closer, 4” 3-Jaw Chuck. Bridgeport Vertical Mill w/ 1.5Hp Motor, 60-4200 Dial Change RPM, Chrome Ways, 9” x 42” Table. Bridgeport Vertical Mill s/n 152771 w/ 1.5Hp Motor, 60-4200 Dial Change RPM, 9” x 42” Table. Jet 7” Horizontal Band Saw w/ Manual Clamping, Coolant. Carolina 30 Ton Hydraulic H-Frame Press. Large Quantity of 12”and 8” Diamond Grinding Wheels. 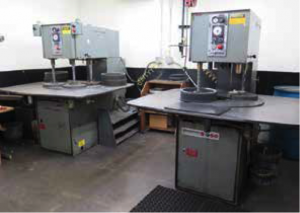 (3) 12” and 9” Rotary Tables. 6” x 18”, 6” x 12” and 8” Magnetic Chucks. (2) 4” 3-Jaw Compound Grinding Fixtures. 5C Indexing Head and Collet Closers.